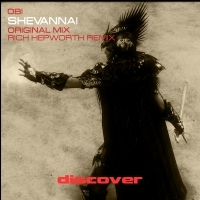 Obi is back with his latest for Discover - Shevannai. Its another biggie from this talented artist. Strong melodies, vocal stabs and cool FX pepper the track throughout and with a breakdown that truly delivers. Rich Hepworth shows the he is no slouch on the remix front with a blistering interpretation. Full on trance with a unique twist. 'Shevannai' is available now from Beatport and iTunes.